These decadent truffles couldn’t be easier to make with Enjoy Life Gluten-Free Brownie Mix! 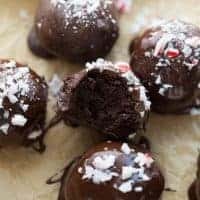 I love using Enjoy Life Brownie Mix for these truffles because it is Top-8 allergen-free, but any favorite gluten-free brownie will work. Preheat the oven to 350F. Lightly grease an 8×8 baking dish with cooking spray. Place the brownie mix, water, oil, peppermint extract and chocolate chips in a bowl. Stir until evenly combined. Pour the batter into the prepared dish. Bake for 25-30 minutes (do not overbake). Let cool completely. Once cool, break up the brownies with a fork, discarding any crisp edge pieces. Roll the brownie dough into small balls. Place on a baking sheet and freeze for 15 minutes. While the truffles are in the freezer, make the coating. Place about 2/3 of the bag dark chocolate chips in a glass bowl. Place over a pot of boiling water and stir until completely melted. Or microwave at 50% heat, stirring every 15 seconds until totally melted, about 1-2 minutes. Add the remaining 1/3 chocolate and stir until totally melted. Dip each truffle in the melted chocolate until coated. Tap of any excess chocolate and place on parchment lined baking sheet to set. Sprinkle with desired topping. Let sit until the chocolate hardens. Enjoy! Truffles will keep for 2-3 days in a airtight container at room temperature.